When I was in elementary school, I was in the drama club. 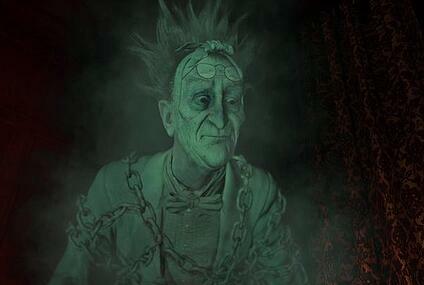 My 5th grade year, I was Jacob Marley in our “production” of A Christmas Carol. I’m sure that experience is one of the reasons that Marley has always been my favorite character. For those that don’t know, Marley was Scrooge’s business partner in Charles Dickens’ famous Christmas story. More importantly, Marley was the “visitor” who alerted Scrooge that the three ghosts of Christmas - past, present and future - we’re coming and to be prepared for it. I always find myself thinking of good old Jacob Marley this time of year, and not just because an infinite number of story variations are being broadcast constantly. I think of him, because as we begin to slow down for the break, it’s a wonderful time for reflection. So, while there’s no Tiny Tim in this story, now is a great time to find a quiet space and review three very important questions before the New Year kicks in. Take some time and reflect. Think back to where things were, and where you were, a year ago (or even three or five years ago). What’s changed? Where are things better? Where might things be a bit worse? Most importantly, what have you learned? I’m a big believer that while results are important, learning is the most important. When I look over my life and career, the times of great growth and success have always been preceded by big learning. Conversely, even when I’ve had great years (from a results perspective), but I didn’t get great lessons, challenges and tribulations soon followed. This is a great habit to get into for even shorter periods of time. The more and faster you and your team are able to learn, the faster you’ll see positive results. I will admit that I’m really bad with this “ghost.” I’m learning the value of really being in the present. I spend a lot of time thinking about the future, and pondering what I’ve learned in the past, but a goal I have for this year is to think more about the present. How do I perceive others are feeling? What’s happening that is in my span of influence? What isn’t? What are my most important priorities right now? One of my lessons from this year is that many of the mistakes I’ve made and where many of things that turned out differently than I had wanted could have been prevented (or at least handled better) if I’d thought more about the present. My experience with growth-oriented people is that this lesson would apply to them as well. Don’t confuse this phase with long-term business planning. With this ghost, I recommend that you don’t go beyond a year. Think about it, so much happens in a year that you just can’t predict. Spend some time and picture yourself at this point next year. A great exercise is to answer the same questions you just answered about the past year, but do it as if you’re answering them a year from now. Make your answers as vivid as possible and create a clear picture of what your near future will look like. Now, here’s a bonus question. When you’ve got a clear picture of what the next year will bring, answer this question: If a year from now we failed to meet our objective, what will the cause(s) of that be? That’s right, debrief failure before it happens. Use your answers to design a plan of action to prevent failure from happening. If you really want to charge the impact of this exercise, have key members of your team answer this question as well. There you have it...my version of A Christmas Carol. As you head into the holiday, be sure to appreciate what you have, thank your team, your family and all those that contribute to making you who you are. Be sure to find some time to let go, relax and enjoy the moment. Then be ready to come back, stronger than ever and ready to make 2017 all that it can be.